After finishing this movie, I think I liked it more than I thought I did while I was watching it. Weird, I know. It’s definitely not my favorite Coen Brothers movie, but it’s also most definitely not the worst. I think this fits nicely in the middle. There are some great scenes, and the acting is fantastic. Honestly, the best parts of this movie are the movie scenes being filmed within the movie, if that makes any sense. Anyway, after thinking about it a bit, I think this is worth seeing, but be warned that it’s not super exciting, or fast-paced. It is what it is. This aight. 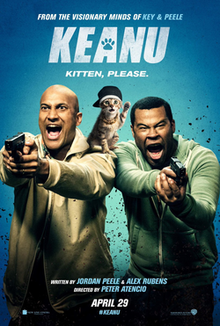 I honestly expected to laugh more, coming from Key & Peele. They are hilarious to me, and there are some pretty funny moments, but overall, it’s just not that funny. The story is silly and fun and unique, and the action is pretty great at times, but I just wanted to laugh more. Just a bit let down. Trying to find some good comedies on Netflix Saturday night, Sheena and I picked this and A.C.O.D. Although this had some laughs, it’s a pretty depressing movie. It’s not a bad movie, but it’s not really anything especially unique, either. I expected something a little more out there from Nick Kroll. It’s worth watching if you can’t really find anything else you think you’d rather see, but it’s not something to put at the top of your queue. Like Adult Beginners, I thought this would be more of a comedy. It also has some funny moments, but it’s much more dramatic than I expected. A lot of dysfunctional family stuff, that’s not funny at all. Another one that wasn’t a waste of time, but it’s not something to seek out. Watch it if you can’t decide on anything else. Definitely the best movie of the weekend, but probably not as good as I wanted it to be. The action and cgi is excellent (except for one scene on a motorcycle), and the story is cool, but it all felt a little predictable to me. I’m not a Star Trek fan, as far as knowing really anything about it before the JJ Abrams reboots, so I’m sure there were things that I probably missed that would’ve made it better for me, but to me, this is the weakest of the series yet. But even as the weakest, it’s a fun, fast-paced, exciting movie. Definitely worth seeing if you like Star Trek. I also watched BoJack Horseman Season 3 this weekend. I love that show. I read this. I learned from it. Wanted you to know. Mwah.